I felt the familiar sensation of frustration and exasperation rise together in my chest as once again I saw a chance for clear explanation of learning, stress and reinforcement histories traded in favor of a moral interpretation of horse behavior. The laws and details of learning are a science. They are clean, spare little laws. Bare bones. They are always there, clear, unafraid and consistent. I want to take apart the story about the horse and the trailer and the food and leadership, so we can see the actual laws at play within that situation rather than the story created around it. It’s only when we see clearly, that we can make informed choices for ourselves as trainers and for our horses as learners, so let’s begin. First, we have to look at the nervous system. I like to describe the nervous system to my clients as the scales of justice, a scale on each side hung from a central point. When one side of the nervous system gets heavier (or activated! ), it hangs down a bit lower and the other is lifted a bit higher. The two sides counter-balance one another. Essentially, one side is for threat preparedness, and the other is for return to homeostasis and relaxation. To make it easier to remember, think of your horse having a “survive” side of his nervous system and a “thrive” side of his nervous system. Officially, the “survive” side is called the sympathetic nervous system or SNS and the “thrive” side is called the parasympathetic or PNS. We all have both and we need both to be alive. Based on your horse’s behavior, you can observe which side of their nervous system they are operating out of. It’s good to know, and it matters a lot when you are trying to work on re-training something previously stressful like trailer loading. On the thrive side we have: rest, digest, feed/eat, and breed. On the survive side we have: fight, flight, fidget, faint, and freeze. When we are truly worried about our survival, we don’t: lay down to sleep, stop for a bite to eat or to check out a love interest as we run for our lives. So, in the story about the horse who loses interest in food when asked to get on a trailer, what that detail really tells us is the horse was worried enough about being asked to step onto a trailer to be pushed into the sympathetic side of his nervous system. His survival instinct just got triggered and when that happens, eating goes offline. But does that mean food is useless when it comes to teaching and maintaining the skill of trailer loading? Oh my gosh, NO! It means you have to know how to use it. And to really understand the power of food, you need to understand reinforcement histories. So, imagine this: Each time you ask your horse for a behavior, they perform the behavior and you feed them (ABC). Each time, they experience a little jolt of pleasure in relation to the behavior you asked for. Over time, your horse will grow to have a general impression, or “classically conditioned emotional response” to being asked to perform this behavior. This emotional response is the composite of every time he performed the behavior and the consequence that followed. So, if each time you asked your horse to walk forward on a lead and they complied, you stopped and reinforced them with some grain, they would have a very positive emotional affect when asked to walk forward. Walking forward predicts good things. So, they feel good when you ask them to walk forward. This is their reinforcement history for going forward on lead. It contains the depth of multiple repetitions, rather than the shallowness of one bucket of food in the present moment. So, cool! It would seem you were all set to walk your horse forward, which they LOVE, and into the brand new trailer you just bought! But here is where folks go wrong. Walking forward near the trailer or into the trailer, ALSO needs to predict good things. This is a separate reinforcement history. (This is compound now. Walking forward+trailer = ?) If every time I walk into the trailer, my person closes me in and takes me on a long bumpy ride and then I’m away from home and my friends for days, then my reinforcement history for walking forward and onto the trailer is going to be poor. Getting on the trailer will predict unpleasant things. To fix this, just breaking the ratio of loading to actual trips helps tremendously. If I load up ten times for every one time that I actually go somewhere, then I won’t worry so much about getting on the trailer. I’ll probably get on quite easily as it usually will predict a nice big flake of alfalfa and then unloading to go back to my paddock. And I’ll eat the whole time, because I’ll be lounging around in the “thrive” side of my nervous system. So what of the horse who refused to get on the trailer and ignored the nice bucket of food? He wasn’t lacking for a leader and he, contrary to the post, DOES find the trailer to be a the problem. Trailers are small, often dark and when a horse steps in they don’t know how long the ride will be and where they will end up. Unpredictability is, by nature, punishing. Think of blindfolding an adult human and telling them you are taking them in the car for a “birthday surprise.”Lots of people panic, pull off the blindfold or get really angry about the situation. Honestly, it’s no different for the horse. They see the trailer, their survival mechanism gets invoked and they go into (often) an extended freeze response to avoid loading up. Their reinforcement history is insufficient to the task being asked. So what do horses need? Horses just need an observant, educated human to assess what part of their learning history needs to be re-worked if they are not loading into the trailer. The time to train trailer loading is not at the horse show or clinic or vet hospital. Yes, there are emergencies and natural disasters and other situations that come up and require urgent loading. And in those moments you do the best you can with multiple tools: chutes, panels, etc, because those are “oh crap!” situations, not training scenarios. But most days aren’t emergencies. Most days are calm and open and perfect for getting to work building deep reinforcement histories. Build yours carefully and deeply enough, and that reinforcement history will always lead right into the trailer. If you enjoyed reading this blog, head on over to my Patreon page and learn more about becoming a patron to join our training community and support writing like this, as well as online courses I am developing! I want to write more for you! Me, at Camp Black Hawk in 1992, happy, but uneducated about learning. The first horses that most of us ride are already trained. When I managed the barn for seven years at my girl scout camp, the horses came to us already trained. Sure, we tuned them up after their winter off, but they came to us knowing all the behaviors we needed them to know. We didn’t even talk about training, or understand the process of learning very well. This phenomenon is pretty much true throughout the horse world, in part because horses live so long and can have multiple stages in their lives, one often being where the horse goes to a beginner or a recreational rider with their skill set already in place to offer the human while they learn the basics of horse care and riding. In effect, because our horses are so long lived, and often so forgiving about their handling and ways of being ridden, training can be something that we understand vaguely as having happened in the past, but don’t truly understand as a process. In addition, because so few people start out with a foal or an untrained youngster, many professionals included, the process isn’t immediately obvious like it is with dog owners who often start with a young puppy who knows nothing about living with humans. Teach your horse to be operant through introduction of target training. If your horse isn’t operant and doesn’t understand they can effect change through their behavior, then you must go back and introduce this step. Even if they seem to have many other behaviors already learned, go back and confirm they are operant and not just passively compliant. Go through the process of teaching your horse foundation lessons. For me this means: Touch a target with your nose, walk forward from a cue on the lead, back up from a cue on the lead, stand quietly in with your head and neck in the center of your chest, aka, “neutral” position, stand on a mat, and offer head down from a cue on the lead. All of these behaviors can be taught from target training and transferred to tactile cues on the lead to avoid learner frustration, but it is very important that the cues transfer from visual to tactile cues as your horse becomes more educated. If they aren’t transferred, you will be limited when you want to begin riding, especially because targets from the saddle throw the horse off balance and badly out of alignment. Initial teaching of these foundation behaviors should occur in an environment where the horse is totally comfortable and learning is optimal. Expand the context of your horse’s foundation behaviors. Use them in new and ever-widening environments: in the indoor arena, in the outdoor arena, on the road from the barn to the indoor, etc. Once you can use your foundation behaviors to help your horse balance out emotionally, they are safe and ready to move on in the process. This stage of training can take some time, so be patient. What do you want to pursue? Now that you and your horse have built a system of communication and you both feel safe working in varied environments, it’s time to move on to new skills. Whether you want to pursue art form dressage, trail riding, horse agility, or working equitation, there will be a whole new set of component skills to teach your horse. Luckily, your horse will now be comfortable in the arena, or the outdoor arena or at a clinic, so you will be able to get to work on teaching the building blocks of your new discipline. And, if your horse gets worried, you know you have the foundation to go back to to help them calm down. Is your horse not even under saddle yet? Congrats! It’s time to start with the building blocks for ridden work! Helping people identify where they are in this progression with their own horses and helping them acquire the skills to teach each individual piece forms the bulk of my work with my students. In my experience, it takes from 2-4 years to learn the entire skill set as a human, but is a much briefer process to teach to a horse once you understand it yourself, six months to two years, depending on the horse. Where are you in the progression with your own horse? Do you know where you are going next? Did you enjoy this blog? Consider supporting my continued writing through my Patreon site! His initial training, which spanned about three months, focused exclusively on teaching Hocus Pocus to carry himself in a new posture. The habitual way a horse organizes their body is a combination of their comformation, their emotional state and what they have been taught, intentionally or unintentionally, in their previous training. Maintained day after day, a horse’s habitual posture will incrementally change the horse over time, either strengthening and improving a horse’s longevity or causing long term imbalances that will result in tension, larger energy requirements in general, joint stress/damage and, often, a shorter lifespan. In Hocus Pocus’s case, his habitual posture was very unhealthy. He tended to move with his head up high, his brachiocephalic (underside) neck muscle braced, his back in tension and his pelvis disengaged out behind him. This posture reduced his range of motion, stressed his joints and made carrying himself, much less a rider, very difficult. I wanted Hocus to work toward his athletic potential, not away from it, so I set out to teach him a new coordination. 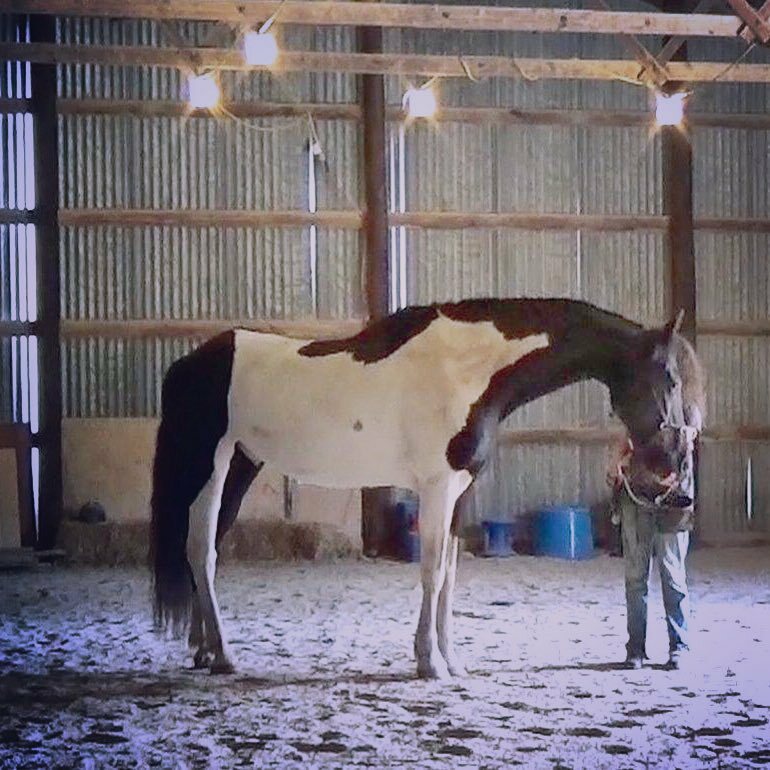 I needed to teach him that lowering and extending his neck and letting his back relax would allow his hind end to step up and under toward his rib cage, making movement easier and allowing him to become stronger through his work. In addition, because he would be in a more powerful balance, he could begin to feel safe emotionally, rather than disconnected and vulnerable. Initially, I taught Hocus this new posture in ground work. Ground work is when a human teaches the horse from the ground, often just in a halter and a lead rope. Ground work simplifies the process for the horse and reduces stress by keeping the lesson straightforward. It is a good starting place, but once the horse has mastered the lesson, it’s time to move on. (To read about the ground work process in detail, read my earlier post, “Shape-shifting into healthy movement”) From ground work, you can choose to move to longeing, in-hand work (work between two reins that educates the horse about how to use their body in relation to itself and in relation to a caveson or bridle), or ridden work. For Hocus, I chose the longe. 1) Longeing offered me an opportunity to re-build Hocus Pocus’s longeing behavior in the positive reinforcement paradigm, confirming that he understood each aspect of longeing and was truly relaxed and active in the process. 2) I could allow Hocus to move out freely at a comfortable speed for him without me having to keep up. This builds fitness. 4) Hocus could practice moving in relaxation for longer periods of time. This builds lovely emotional control for riding. His neck is shortened, his hind end is out behind him rather than stepping toward his center of mass and his underline is the same length as his topline. He’s just slouching along; exercise in this posture will have no real benefit. This is a clickable moment! Here he is moving with a relaxed back and lengthened topline, which, in turn, allows him to have softer joints and a more expansive range of motion. His inside hind leg is stepping quite deeply for him up and under his rib cage which is the first touchstone on the road to collection. The entire picture gives the impression of roundness and elasticity. This is an “access posture”, meaning it’s not a long-term working posture, but an initial coordination where I can begin to influence Hocus’s hind foot flight arcs and general pelvic orientation. This is the posture where real conversations about balance and strength can begin. This is the organization he chooses for his body now because of the solid reinforcement history we built over the last few months. He was clicked and fed for choosing this organization hundreds and hundreds of times. It’s a “default posture”, meaning, unless influenced otherwise, he chooses to move in this general shape. Watching the video, it’s easy to see that sometimes he drops his head too low and this makes him heavy on his front end and shoulders. He also still lacks any real power or engagement behind, but none of these things are anything to worry about at this stage of his training. All that matters right now is that he has the gross motor pattern of an open, lengthened spine and a relaxed back which allows his hind end to step up and under toward his rib cage. As he repeats this coordination in session after session, he will begin to step under more and more deeply and coil his loins to lift his back. Then, it will be easy for him to raise his head and neck; it will happen organically. It’s also easy to see that longeing is being used to reinforce a specific skill, not just to blow off steam or to allow my horse to move in an over-stimulated or unhealthy way. Hocus has a clearly defined behavior to offer on the longe. This helps keep him focused on his own body rather than worrying about the environment. This is a beautiful starting point for our ridden work that will come later. Riding begins on the ground. From this biomechanically healthy place between two reins, I can start to teach stretching down into transitions and correct, balanced halts. These will help Hocus Pocus become more agile AND more confident about accepting suggestions from a human regarding his body. When we do begin riding for short periods, he will already know how to slow down and stop by stepping up and under with his hind feet, rather than slamming his weight onto his shoulders. It will just be one more cue transfer from in-hand to under saddle. Below is a short video of Hocus Pocus working in-hand, learning to stretch down into a downward transition, rather than shortening into disengagement. You can see that he is largely able to stretch forward into the contact offered. When I ask him to walk by gently squeezing alternate reins, he has a few strides where he reverts to his old habit posture and raises his head and drops his back. That’s good information. He doesn’t get into trouble for this behavior, he’s not “wrong”, his old learning is just showing through. So we keep walking and I make contact with my outside rein and he is able to pick up that contact and stretch forward into it. A beautiful recovery and a clickable moment. Over time, he will regularly choose the new, lengthened posture over the old, stilted posture because of the reinforcement history, practice (repetition) and physical comfort it provides. Before I can even consider sitting on Hocus’s back, I need to confirm that he can carry just his own body with strength and coordination. Adding weight, even with a small person like myself, makes maintaining these healthy postures much more difficult. Learning to carry weight is a gradual schooling process. Years and years ago, when Hocus Pocus was only three, I was the first person to “back” him, or sit on him just to introduce him to the idea that humans sit on horses (not to begin riding training, too early!). I remember that he dropped his back immediately and I decided he needed months more of work before I sat on him again. He was too weak. Now, I have a chance to re-start him, but with far more tools at my disposal than I had before. He is still the beautiful learner that he was, and now he is a mature horse coming eleven. With consistent work through this winter, he should be strong enough and educated enough to begin light riding in mid-spring. 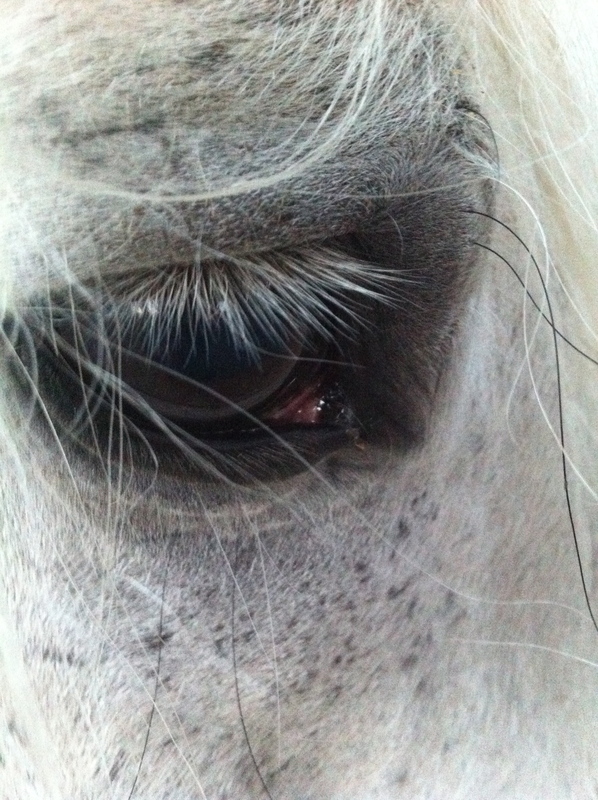 As long as I have had Tarot, I have had him sedated for hoof care. Between his deep fear of unfamiliar people and his past life history of tension and fighting over just having his feet lifted and cleaned, much less trimmed, it was easier and safer to get through the process with a drug that helped him be calm physically and mentally. Over time, though, I was becoming less and less of a fan of the frequent jugular sticks and the the expense of the drug every six to eight weeks. It would be more ideal to have Tarot collaborate in his care. I already had most all of the pieces in place for a successful “awake” hoof trim, but then the final piece fell into place: my wife, Sara, started to study with hoof professional Ida Hammer. 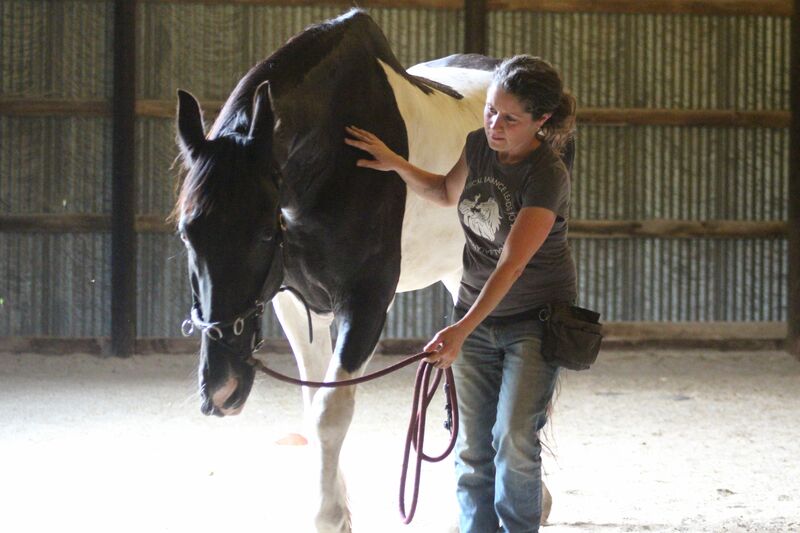 Tarot now had a familiar and trusted person available to work on his feet. Still, this was not going to be a traditional hoof trimming session, I needed to create a structure that felt safe and empowering for everyone. It looks simple enough, but there are strict contingencies operating here, both for the humans AND the horse. Let’s look closer at them. Initially, I stand near Tarot’s head and wait for him to offer a hoof lift. This is very likely, because he has been reinforced for the behavior so many times in the past twenty-four months. I click and reinforce him for several repetitions so he knows this is the “hot” behavior. I then bring Sara in by my left shoulder, NOT in an active handler position. I wait to see if he will offer his hoof lift and I use this information as guidance about whether or not we will go deeper into the process. If Tarot can offer the foot lift with a second person standing by my shoulder, I know he is still relaxed enough to continue. After reinforcing three or four hoof lifts with Sara at my left shoulder, I ask her to move to my right shoulder and into the more active handler position. This is much more vulnerable for Tarot. If he were to move away, back up or leave, we would go back a step in our process and end where he was comfortable. If he offers his hoof lift with Sara in a more active handler position, which he does, he is clicked and reinforced. He has given us permission to move forward in our process. After three or four repetitions of the hoof lift, I give Sara the green light to take a hold of his hoof when he lifts it. If he pulls it away, it is given to him. It’s his foot and he is allowed to say no. If he allows her to support his hoof, I immediately begin a “continuous feed” to provide huge reinforcement for his choice. I continue to feed him as long as his foot is in Sara’s hands. When Sara sets the hoof down, the feeding stops, and Sara steps away. At that point the session is over unless Tarot cues Sara to do more hoof care by offering his foot again. Which he does. 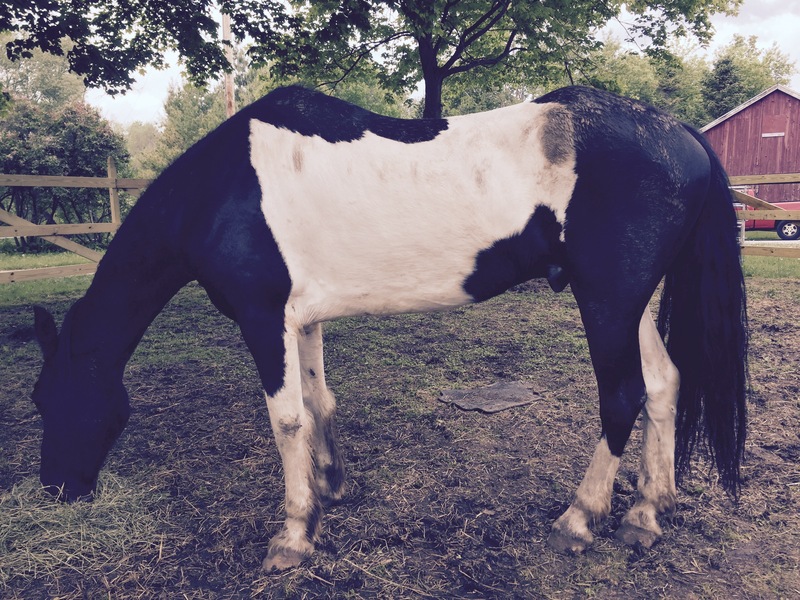 Tarot controls at what level he interacts with the hoof care professional and how long the session lasts. If my set up is ideal for my learner both individually and species-specifically and I have included all of the necessary component pieces, the session will go smoothly, the animal will remain calm and the humans will be able to accomplish their tasks easily. 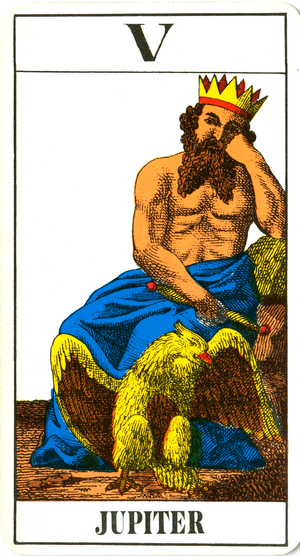 Per Tarot, the session contained all the components for him to collaborate in his hoof care. Success! Teaching the animals in our care to be active participants in their husbandry procedures has a positive effect on the quality of their life and magnifies the bond between us. Preparing them for the procedures that are necessary for their health and well-being is humane, reduces stress and increases safety for owners, vets and professionals. These are facts. But for me, there’s something larger and more serious on the table. Trust. Charles Feltman defines trust as “Choosing to risk allowing something you value to be vulnerable to someone else’s actions.” With Tarot, there wasn’t a way to love him into trust. He was too mature and too wild and too skeptical for such a human conceit. But by setting him up for success in relation to myself and other humans, over and over, in small and measurable pieces, something generous and expansive and lovely has appeared out of only small, unassuming layers. This spring I was lucky enough to purchase a horse who I loved many years ago but thought I would never own. 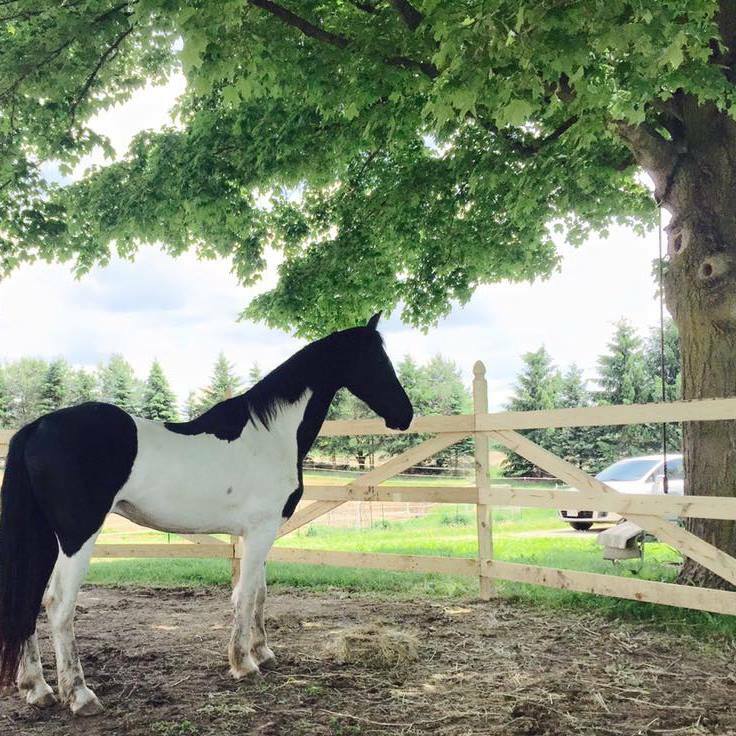 Hocus Pocus is a tall, black and white, Saddlebred/Friesian cross who was mine to train from the ages of two to three. Even as a two-year-old, he was the sort of horse who was thoughtful and kind. He was such a good learner, and so easy to train, that I called him my “yes” horse. I wanted very badly to buy him for myself but he had been purchased to prepare for sale, and I knew I could never afford him. This year, seven years from the last time I saw him, his owner now with both a young child and a business to run, decided she just couldn’t offer him the time she felt he deserved. When she contacted me to say he was for sale, I arranged to go see him with a check and a trailer. I wanted to welcome him here at Idle Moon Farm to join the rest of my family. You can see that the top of the individual vertebrae are visible, as well as the top of his sacro-iliac joint and a very prominent point of hip. He was going to need some serious conditioning to put muscle back in the right places and make sure he became stronger instead of stiffening into this muscular imbalance. People often believe, as I used to, that turning a horse out to pasture for six months or a year helps them to loosen up and heal. But the truth is horses turned out to pasture tend to reinforce the same muscular patterns they had going into the time off. Six months or a year out to pasture often yields a horse who has the same crookedness or weakness, sometimes more pronounced, in addition to them then being out of shape. I wanted to start changing the muscles Hocus Pocus used in movement, preferably with a good head start before winter. I wanted him to have some mass to take him through the cold and over the slippery spots. The first order of business was to get Hocus moving throughout the day, so he could do lots of walking and start to build up some muscle through easy, low-impact exercise. Once he was worked onto grass, we let him out onto our track system so he could walk and graze alongside the other horses. Having his head down kept him released over his back and allowed his tight, weak muscles to move through their range of motion and build up some strength. Having a paddock set up that allowed him to move as continuously as possible all day long provided much more movement than one human trying to exercise him ever could. The second order of business was to teach Hocus Pocus a new way to carry himself posturally. He tends to be nervous in the arena, his head flies up, his back inverts and he braces his big brachiocephalic muscle on the underside of his neck. This tension limits his range of motion, stresses his joints and continues to atrophy the back muscles he needs for healthy locomotion. To begin to change his habits, I taught him to lower his head in the halt from the ground. 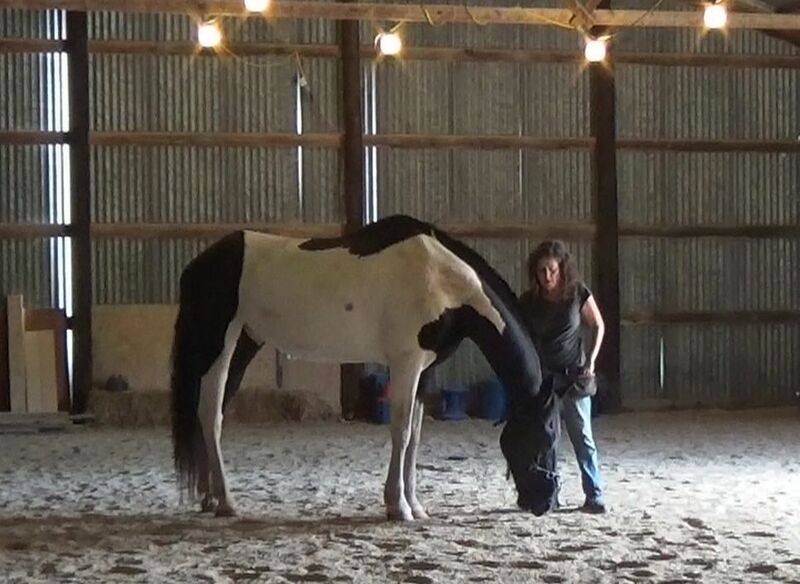 The head-down behavior serves a dual purpose: it allows Hocus to self-calm by giving him a measurable behavior to concentrate on in the arena and it is the new gross motor pattern I want him to generalize and offer. There are other bells and whistles to add on, but the main pieces are there: lengthen your neck and release over your back. Before adding bend or asking for any other nuances in the way he moves, I want him to know one thing for sure: a lengthened topline is the right answer. When in doubt, start there. Click. Treat. At first we spent most of our time in the arena in the halt in the head-down behavior. Every time I asked him to walk off his head would fly up and he would take short tense steps. After three or four steps, I would click him just for staying with me regardless of the quality of the movement and we would go back into our deep meditation within the head-down behavior. I would ask him to do three to five repetitions of the behavior, clicking and treating each one, until he felt calm and centered and ready to walk off again. Hocus Pocus had been caught in a vicious cycle. He was naturally a bit “startle-y”, which caused him to tense and tighten. The tightening and tensing up made his body uncomfortable, which caused him to spook and startle even more. Left to his own natural inclinations with no support or new learned response, he was only going to reinforce his old, habitual patterns of fear and unhealthy movement. Head-down offered him room to begin to change shape emotionally and physically. In this deceptively simple behavior there was space for a new horse to emerge. Since the behavior was taught and maintained with clicker training, there was the added relaxation of food and fun woven into the training sessions. Lightbulbs went off. Soon, Hocus Pocus was able to start lowering his head in the walk from a gentle slide on the lead. Soon after that, he was able to offer more and more steps in walk with a lowered head and his back muscles working in relaxation. Soon after that, he began to breathe normally again in the arena space and he stopped spooking at noises and counter-bending to swivel his head around to look in every corner for danger. Very soon, I had a true partner who was motivated, relaxed and an absolute pro at stretching over his topline and keeping step with me. The entire process took roughly four weeks. Hocus and I have only just begun this new leg of our journey together. It’s so rare to get anything back that you have lost; he is the first second-chance I have had in my life. I want to honor him by keeping him healthy, helping him to be strong and teaching him how to relax and truly love his work. Yesterday morning as I watched Rumi cantering through the snow, totally relaxed with an even cadence, I thought how lovely it would be to ride him. It’s not the first time I’ve thought about riding him lately, his pasture gaits are really very balanced and full of impulsion and more than once I’ve just stood holding the hay in my arms while I watch him trot or canter with lovely control and variation within his gait. He’s a very athletic horse. He’s also a nervous horse who bucked a lot of people off when he was started too quickly under saddle. Before I get on him, he needs to have mastered many skills he doesn’t yet have. To do it well, I need a plan, both for individual sessions and a larger outline that helps lead the way to where we are going. Since it’s New Year’s Day, its a fitting time to lay out broad goals for all of my horses and release solid intention into the universe. Rumi : I would like to work toward riding Rumi. This means teaching him the six foundation lessons: target, happy ears, back up, head-down, the grown-ups are talking (stand quietly), and stand on a mat. These lessons can be taught first in the barn where he is comfortable, then out on the big driveway circle and then finally in the indoor and outdoor arena. Once he is comfortable with these lessons and relaxed in either arena with all the foundation lessons, we can move to WWYLM (Why would you leave me?) on a cone circle. I’m excited to get to work on his physical balance because I think he’s going to enjoy the work. I suspect it will change him emotionally and I am eager to reach that phase. I will set a loose goal of sitting on him by this fall while he works in-hand on a cone circle with a header. Then he could have a few winter months off and we can pick up in spring and begin riding on our own in the summer of 2015. An eight year old Arabian certainly has a good 20 more years of riding. Dragon: Dragon is the most educated of my horses and a very fast learner, so mapping out an entire year seems too large. He changes and progresses so quickly and has so much to teach me that I really can’t claim to know where we will be in six months. It’s a conversation based on what comes up during our rides. Currently, we have been working on and have achieved a very open, engaged walk that “has the trot available” within it. He’s using his back beautifully and becoming quite strong. His muscles have evened out and we no longer need our right side shim which balanced out his weaker muscles on that side. I’m learning how to keep him in balance in that walk and my goal is to be able to request that walk and have him be able to maintain it joyfully on the circle, across the diagonal, in half-turns in reverse and throughout all the “training turns” without losing a particle of impulsion. (Nuno Oliveira) We are working on brief trots when his balance in the walk is divine and clicking before there is any loss of balance. In-hand we are working on haunches-in and shoulder-in, so we both have the feel of it in our bodies before we ride it. We are working on duration for haunches in and still fiddling with an ideal balance for shoulder-in. We are also doing much more trot work in hand, releasing Dragon into his own balance when he finds a good equilibrium and clicking him for maintaining that on his own. For my part, I am working on my seat and own riding both in dismounted and mounted exercises as well as deep body awareness. I need to be as balanced, strong and aware as I am asking Dragon to be. Djinn: Djinn will be five this summer, so it’s not too early to think about riding her. I already bought her a beautiful blue swallow tail saddle pad, so I’d be lying if I didn’t say I have been thinking about it. Djinn has already has learned five of the six foundation exercises; I still need to introduce “stand on a mat” to her, but everything else she learned last year. Even though she already has a reasonable foundation, I am going to review each exercise with special attention to how light she is and how *connected* she is within her body. She is a horse that can get “stuck” in her body and I want to feel like my lead/rein is literally just an extension of her body, even in higher arousal situations. So we will be going back through our foundation work to add in layers of refinement. From there we will move to WWYLM on the circle and then all the same work with the saddle on, as well as “mounting block games”, teaching her to line up with the block. I really adore this little mare and I think she is going to look spectacular moving in balance. It will be interesting to compare the differences between her and Rumi as we look toward riding – how they both need to learn the same things, but likely need totally different aspects of the work emphasized. Tarot: Tarot is the horse that pushes me to explore the outer edges of possibility and to use intuition first, guided by the good science of learning. This year I want to explore his feet handling issues more intensively so he can learn to be comfortable for trimming without sedation. I’ve put together a new protocol that I’m excited to get started on once it’s warm enough. We’ve also began de-sensitizing to the fly spray, which he’s shown continuous improvement with, until it became to cold to spray a liquid into the air. I like to balance out working on fear issues with more emotionally easy and enjoyable work for him. Tarot has learned all of his foundation skills to fluency, so we will be starting more work in-hand. We will start by reviewing his skills in the indoor arena and then move to WWYLM, which he had 3 or 4 sessions on last year. I am excited to explore balance work with him, to see him grow stronger and for him to feel powerful in his body in concert with a human. Humans have taken so much power from him and restricted him so frequently. I am interested to see what he has to say about this piece of the work in particular. I am also interested to explore shaping on a point of contact and the deep tactile listening it develops. There’s something that opens up down the lead or rein when you and the horse are concentrating on that same point of contact, it’s like your nervous systems become one circuit and the feeling is indescribable. I want to know if that is possible with him. If it happens, I will know someday I can ride him. 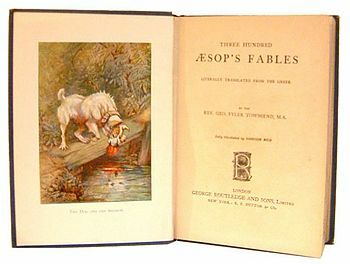 Aesop: Aesop will be seven this year. He’s already safe and started under saddle and he’s a lovely, easy horse to teach. He is very light and responsive in-hand and actually has much more energy and impulsion in-hand than under saddle. It only makes sense – he’s been working with me on the ground for over two years and the level of refinement and solid reinforcement history shows. Riding is newer and he looks like a less advanced horse with a rider. He has a more common balance and still some questions to be worked out. My initial focus for him this year is to help him transfer all those wonderful qualities he has in-hand to ridden work. We will continue our work in-hand, focusing on “Three-Flip-Three” or connecting his hip to the rein. This will allow him to really step under with his inside hind and carry himself in a way that is correct and will help make him stronger and more “through”, meaning, his energy will move cleanly and easily from the push of his back hoof all the way up through his back in a cycle of energy. Once he is understanding that equilibrium better, I will add in trot work in hand with that understanding, so he can be reinforced for working in a gait with more energy, but correctly. He likes to trot in-hand, but he lacks power, so that needs to be added so he can carry himself and me. I will continue riding but with a person at our head to work him in-hand while I ride. Aesop needs some help with accessing the same balance in the saddle as he has on the ground. A person at his head can help him with familiar cues so that he can find the same balance and impulsion and start to offer it when ridden. Like Dragon, Aesop is more advanced, so planning out an entire year would be too big. This work will take us about six to eight weeks, so will keep us busy during later winter and early spring. By summer we should have some lovely videos to share. Those are my basic big picture plans for my horses. Teaching emotional control through foundation lessons. Teaching physical balance. Combining the two to create a reliable riding partner. Refining physical balance and tactile communication in an ongoing effort toward the centaur. Re-visiting foundation lessons to focus on and reinforce lightness before starting under saddle. Setting up new, functional behaviors for feet handling and basic husbandry in place of old, fear and anger based behaviors through unconventional teaching. Using good physical balance to build confidence, strength and emotional engagement. Using in-hand work to inform balance and learning with a rider through utilizing a ground person. When you look at the list, in the end, everything is about balance. 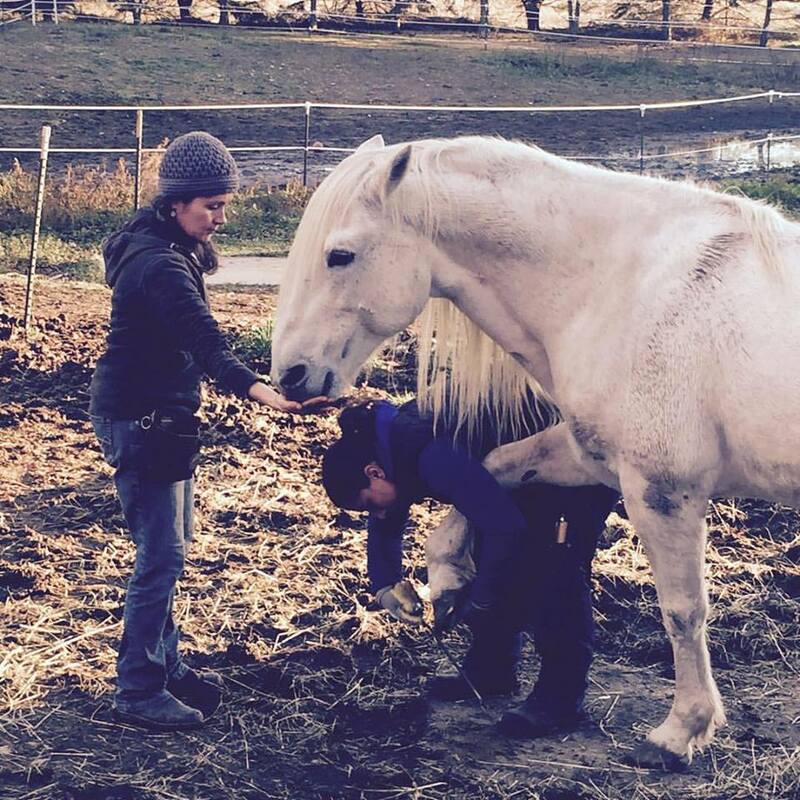 Clinicians talk a lot about being centered and working on yourself and then working on your horse. But what does that mean? It just means: learn to be self-aware enough to see what you are doing and know what you are feeling. Learn to understand the horse’s emotional states and how to help them shift easily between them. Learn to understand the horse’s horizontal balance so you can help them find strength and fluidity when they are having trouble. Everything I have as a goal for my horses takes them more toward “a condition in which different elements are equal or in the correct proportions.” Horses are a shifting puzzle of behaviors, motor patterns and behavioral tendencies that can teach us exquisite observational skills and body awareness if we accept the challenge of learning what they need to be in true equilibrium. When I decided to purchase my mustang stallion, Tarot, I knew I had a long road in front of me. He had been in one home for each year he was captive. That made for six different homes before he finally made it to our farm. I knew he was what most people call a project and I wanted what he had to teach me. He was eleven years old and had yet to meet a human who could teach him what they wanted him to learn. Things like walking up to be haltered, being fly sprayed in the summer, accepting a saddle without exploding and being led without bolting. But Tarot’s biggest issue from his past is allowing foot handling. He has a long history of kicking people that picked up his back feet but also of pulling away and being very uncomfortable with any of his feet being picked up, cleaned or trimmed. Most people just gave up and let them grow because he was dangerous or unpredictable when his feet were handled. It was uncomfortable for everyone. One of his past homes had a trainer out to help him learn to be handled but he took the “cooperate or run” approach. If Tarot kicked he made him run. Eventually Tarot would give in out of sheer exhaustion and they would get a few feet done, not always all four on the same day. It worked as a method outwardly, he did surrender his foot, but Tarot never learned to be more open to having his feet handled. Instead he learned when a human reaches for your hoof they are likely to turn unpredictable, demanding and obsessive. Hoof care for Tarot is deeply poisoned. It’s also our winter project. It is infinitely easier to teach a behavior correctly from the beginning than to teach a new response in place of an undesirable one. Once a neural pathway has been mapped it can’t be erased. You can only build a new one and help the learner choose it over and over and over until that pathway becomes the habit. It sounds kind of simple but in practice it’s not so easy. That’s why I love my untouched mustangs so much, they are blank slates waiting for good information. Tarot has already been “programmed”, so to speak, and it is up to me to avoid the expression of those old responses while teaching something new. Learning can be bound up in a tactile sensation, which is unfortunate, because picking up feet can’t happen without some touch at least once you get down to cleaning out feet or actually trimming them. So how to approach the subject with him? I have already faded the whip to just a finger point, mostly because I am incredibly clumsy walking with it by my side in the slippery snow. So my cue for the foot lift is to say the word “foot”, switch my lead to my left hand and point to his knee. When he raises his foot I drop my hand and I click when he seems relaxed. I’m not working on teaching him to pick up his feet, he knows how to do that now. I’m working on building relaxation like bedrock into the skill. The foot lift is the motion but the relaxation within it is the goal. How do you speak to a horse about relaxation? You need both a clear training language and good listening skills. Tarot has to have the freedom to refuse my requests and the safety to express his conflict or anger without punishment. I have to know how to stay safe and non-reactive myself when he is upset. I need to be able to read small expressions of conflict/tension so I can see how well he is handling the work and make adjustments accordingly. I also need not just a “yes” answer (the click), but a “that was spectacular” answer so he can more easily understand the work. Right now, any foot offer without any tail swish or head raise is clickable. But sometimes he kicks his foot backs when he goes to set it down because he is tense and frustrated. I have already clicked so I am going to feed him because I don’t want to seem unreliable. But, when he softly offers his foot and lowers his head and sets it down softly he gets a click and treat and a chance to do a few nose targets. The nose targets are an easy behavior where he is sure to earn reinforcers and they offer the functional reward of a break from focusing on his feet. Here you see he is unable to lift his foot without extreme tail swishing/tail wringing. This tail movement shows how conflicted he is about me being on his right side and asking for his feet. He also leans his head and neck off to the left which is another conflict behavior he offers when he is uncomfortable and thinking about leaving. In it’s extreme form Tarot would spin away and present his hindquarters to me in a kick threat. He also is hurriedly offering me feet over and over even though I haven’t even said the cue or changed my lead rope to my inside hand. I’ve found with my mustangs when they are still nervous about their feet they offer them quickly and often instead of waiting to be cued. I’m not going to fuss about stimulus control when I am working on relaxation. So what to do? My rule of thumb is if he can’t offer a quiet response I will feed him for any foot lifting response despite the conflict he is showing. If he can eat he will begin to relax. So even though he is full of angst I feed him for each and every time his foot is in the air regardless of his emotional state. I do make a few mistakes because I was surprised at the level of conflict he displayed and had to change my plan on the spot. I should have just reached in my pouch and began feeding him immediately, sans click, the moment his foot left the ground. This is called counter-conditioning. Once he is able to offer a more relaxed response, then I will click that response and ask him to target as a reward. That response will become my new criteria. He raises the bar on his own at his own pace. By the seventh(!) repetition he offers a relaxed foot lift with no tail swish. I click, reward him with an opportunity to target my hand, and go back to his left side to give him the ultimate functional reward of leaving his right side. You can’t force relaxation, you have to draw it out like a shy animal. You create the conditions for it to exist.